Heavy Foursquare users, you have a new app to get immediately. Future Checkin is an app that allows you to check-in to your favorite Foursquare venues automatically when you’re near them. You don’t have to do a thing besides simply have your phone on you and this app will check you in while running in the background with iOS 4. Developer Tim Sears says he was actually inspired to make this app by our posts about iOS 4 background location and check-in fatigue. Check-in fatigue in particular is a growing problem. A number of heavy users of Foursquare that I know (myself included) have been complaining in recent months that it’s getting a bit tedious to have to pull out your phone each time to check-in to a venue. Particularly venues that you frequent. Future Checkin absolutely solves that. There is also an option to automatically check-in to venues you’ve been to recently (ones not explicitly marked as Favorites). In the “More” area of the app you can toggle this on and off. From here, you can also turn auto Favorites check-ins on and off. 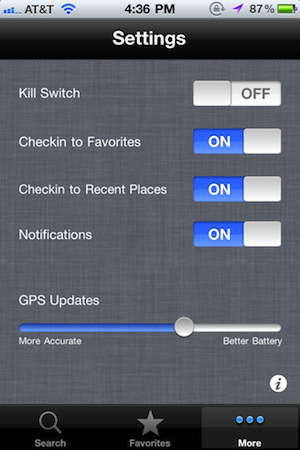 You can also turn off notifications (that send you a Push Notification when you’re automatically checked-in to a venue), and toggle the “Kill Switch” which basically turns off background location. All of this works thanks to the new ability for third-party apps to run in the background with iOS 4. Location is one of the features that can remain on when you leave an app (a slider in the settings allows you to determine if you’d like the GPS updates to be more frequent or save some battery life by making them less frequent). “This app is really designed for people who are getting check-in fatigue, who often forget to check-in to places, or who don’t want to be rude by pulling out their phone in social settings. Who it is not designed for is people trying to cheat Foursquare, so Future Checkin will only check you in to a place once every four hours, and never the same place twice in a row,” Sears says. As for the future of Future Checkin, Sears says that he plans to implement Gowalla integration too, as soon as their write API is ready to roll (hopefully this week). That could help solve the larger issue of check-in fatigue — checking-in across all these apps at various venues. Future Checkin’s solution would basically be check.in that runs in the background. Awesome. 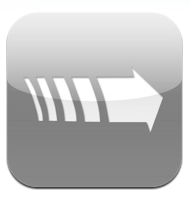 With the launch of iOS 4, Loopt was the first app with the ability to run location in the background. But that doesn’t auto check you in to venues, instead it just continually shows where you are to your friends on a map. In that regard, it’s more like Google Latitude. That may actually be a better solution for many users now, as it’s not yet clear if the world is ready for these auto check-ins. But power users of Foursquare certainly are. And this app speaks to how this stuff might work in the future. 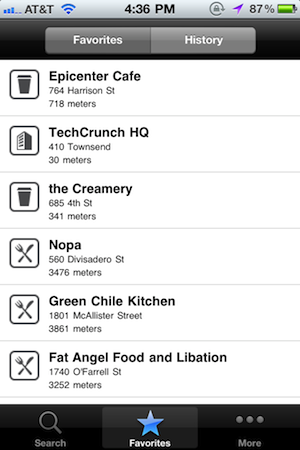 The only question may be: will Foursquare itself implement such an option soon? Future Checkin is $0.99 — a special 50% off price for launch week. Find it in the App Store here.